After years of endless kvetching that we didn't have something amazing for Hanukkah, we are proud to carry the long overdue Shalom Gnome, and he is absolutely fantastic! The perfect Hanukkah garden gift for all! Have a hard to shop for Jewish mother? Need a gift for your temple or Rabbi? Great on between the lights of your Hanukkah candles and a perfect Jewish Garden Gift for any holiday! Cast Resin, 13 inches tall. 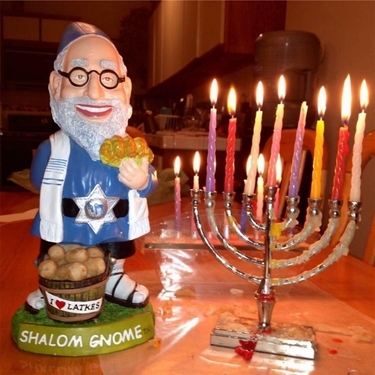 This Hanukkah gnome is a great size: Large enough to enjoy in the garden, or small enough to place on a counter, kitchen island, or entrance way.